If anyone could understand the temptation to let busyness distract Him from the Father’s activity, Jesus certainly could! He told a parable that clearly illustrated this danger: A certain Jewish man was on his way to Jericho when he was brutally attacked by thieves and left to die by the road. First a Levite, then a priest, passed by. These were religious leaders; surely they would show compassion to a wounded person! But they had places to go and appointments to keep, so they passed him by. Surely someone else would come along who had more time to help the wounded man! Then a Samaritan, despised by the Jews, came along. Of all people, this man had reason to look the other way, since the wounded man was his enemy. But wherever he was going could wait, for someone needed his help. It’s easy to become so busy that you are oblivious to those in need. Your schedule can become so full of accomplishing good things that you are of no help to the people around you. God is at work in the lives of your friends, your neighbors, your family members. 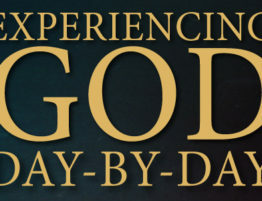 He may ask you to interrupt your day long enough to join Him as He ministers to them. Nothing on your agenda, no matter how pressing, is reason enough to ignore the voice of God when He tells you to stop and help. If you have become too busy to minister to those around you, ask God to reestablish your priorities so that you do not miss opportunities to serve Him.